Thank you for convening this timely special session of the United Nations Security Council on Iraq. I would like to thank you, Mr. President, for the presidential statement, that is very comprehensive and that we subscribe to. I would also like to thank our former colleague and now Representative of the United Nations in Iraq for his very comprehensive and helpful report on the situation in Iraq. I would like to congratulate my colleague H.E. Minister Ebrahim Al-Jaafari for assuming his post and I look forward to work with him especially in this very important time. The security situation in Iraq and the spread of Daesh in the last couple of years in Syria and Iraq is a serious regional and global concern; Daesh have exhibited an appalling level of brutality and disregard for human life as demonstrated by the murders of journalists, aid workers, and countless Iraqi and Syrian civilians. Our shared objective should be no less than the complete annihilation of this terrorist group. The fight against Daesh requires joint action at the regional and international level in three crucial arenas, the military, the financial, and the ideological. Concerning military operations, it is essential that countries join Iraq in their fight against Daesh by providing the requisite level of support. When it comes to regional security, Bahrain has always assumed its fair share of the burden. We joined our friends and allies in securing Afghanistan, and in the fight against pirates and corsairs in the Indian Ocean, and by keeping a watchful eye around the waters of the Arabian Gulf. Today, Bahrain stands ready to join its allies in the region and the world and to contribute its share to the necessary fight against Daesh. We firmly believe that the time has come for countries of the region to take the lead in fighting the terrorist groups amongst us. Moreover, Islamic institutions and scholars around the Arab and Muslim world must not hesitate to point out the clear deviation of Daesh and similar terrorist cults, and to delegitimize any religious justification that they may give. In this regard, Bahrain commends the condemnations of Daesh from various centers of Islamic authority and scholarship, and urges scholars to continue doing so without any hesitation to help us defeat this clear danger threatening Muslims and non-Muslims alike. Stopping the flow of fighters and financial resources to Daesh is crucial to defeating it. 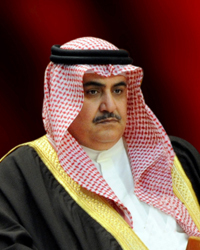 The Kingdom of Bahrain, as a longstanding Islamic and Conventional Financial Centre with a proven history of Combating the Financing of Terrorism (CFT) and money laundering, will host a high level government conference to discuss ways of enhancing efforts to combat the funding of terrorist organisations both within and outside of the Middle East and North Africa. The conference will be held during the first week of November in Manama with a view to agreeing a “roadmap/action plan” on how to further combat terrorist financing to ensure that MENA financial institutions and charitable organizations are not used to channel funds to terrorists and other illegal activities. Concerning stopping the flow of fighters, Bahrain continues to monitor the flow of individuals to affected areas to ensure that those with the intent to join Daesh and similar groups are stopped before leaving the country. In addition, those who return after joining such groups are immediately apprehended. Further, the alleviation of daily difficulties and challenges faced by the Syrian and Iraqi people is no less important than the fight against Daesh. Minority groups in particular have suffered disproportionately in recent years and the international community must do all it can to provide the necessary aid through UN relevant bodies, in addition to other international and national authorities. I would like to take this opportunity to offer Bahrain’s support to H.E. Prime Minister Haidar Al Abadi and his newly formed cabinet. We are confident that the new Iraqi government seeks to set a new path for Iraq, one that will return Iraq to the path of peace, security and stability. Finally, we must remember that fighting terrorism is a regional responsibility, and that all regional countries must adopt the same position regarding terrorism wherever it may surface in the region, and whatever its sectarian leanings. There are terrorist groups no less criminal than Daesh operating across the Middle East from Egypt to Libya to Lebanon/Syria to Yemen to the Gulf. State sponsored terrorist organizations such as Hezbollah and other proxies continue to terrorize and kill innocent people all over the region. It is therefore necessary to adopt a holistic approach – as many of us here have said – and I’ve heard my colleagues say - a holistic approach that identifies, confronts, and eventually defeat the terrorists in an effective manner. Thank you very much.